Amy's Peacock Paradise has moved! Please go to http://www.amyspeacockparadise.com/home.html for more photos, more information, and no pop up ads! Please update your favorites. Although the old site will stick around, only the new one will be updated. New photo galleries have already been added, and there is a lot to come! I hope you enjoy. Welcome to my website devoted to my favorite animal, the peacock. If you love peacocks as much as I do, or just want to learn more about these beautiful birds, than this place is for you. Ever since early 1999 I have been extremely interested in these birds. I got my two first peacocks in early October 1999, after months and months of wanting them. I got eight more young peafowl in October 2000. And on July 3rd, 2001 I hatched my first peachick. Saddly, she fell prey to a wild fox, but another chick hatched out in late August. This site is dedicated to them, my 12 great pets. I started this site for all the other peacock lovers out there and I hope it will continue to expand and include more different types of peacock information and fun for everyone. I want to create the ultimate peacock experience so that even those who don't own one of these wonderful birds can still experience their magnificent grace and beauty. I have worked very hard creating this site, and your comments are greatly appreciated. 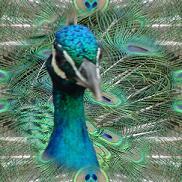 If you have any peacock clipart, photos, drawings, links, or info, I would be glad to consider adding it to my site. You can email me at peacockgirl@verizon.net or sign my guestbook. So take a look around, and I hope you enjoy this peacock paradise. For six years I have been heavily involved with Relay for Life. This year I am co-running the Five College Relay for Life in Amherst, Massachusetts. If you are able, please support me in the fight against cancer by clicking the logo and making a donation to the American Cancer Society. I would greatly appreciate it, as would all the cancer patients the money goes to support and those affected by the research the ACS funds. Thanks! My site is now divided into four sections, each offering a different type of information. I hope you enjoy them all. 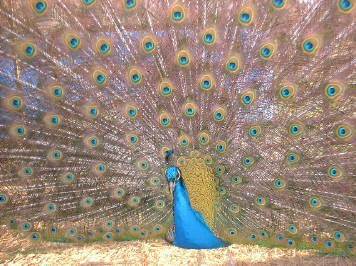 My personal favorite, here you can learn all about my own wonderful peacocks, all 12 (yes 12) of them. Here I have gathered as much information about peafowl as I could find, with more added all the time. Confused by all the new types of peafowl available today? Find pictures and descriptions here. Come here to find peacock clipart and quotes, join my peacock webring, and see all the awards I have won & the webrings I belong to. My peacocks and I thank you for stopping by. Please check back soon because I update this site often and am always trying to come up with new pages. I hope you enjoyed your stay here! I apoligize profusely for how deeply this website has fallen into disrepair over the last five months. Unfortunately school and extra curricular activities took all my time the last few months and kept me from updating, much to my chagrin. But now since school is out, I promise to fix up this site. There are still pages that are still using the tired old layout which I plan to fix, as well as adding a lot more content and pictures. Stay tuned within the next few weeks, and I promise you'll be impressed! Coming Soon: Updated information on all my peafowl, included a new page honoring Spaz the peacock; updated photos galleries; new entries in the Peafowl Varaties Database; more links; all pages completely rewritten in HTML in the new layout; and much much more! I must sadly say that due to time constraints I am no longer competing at the Fantasy Fights, but I want to thank everyone who has visited this site because of web competitions, or voted for me in the past, and I hope you'll check back on this site every once in a while. I have enjoyed my time there, and am still a sprite for the Legends of the Myths team, so if you ever see Sprite Peacock Chaser around, that's me! I am now a proud AllPosters.com affiliate. Please check out their selection of peacock and peafowl related posters and art prints at my Peacock Poster Store and help me keep my peafowl paradise running!